All proceeds from 2017's concert tickets, raffles, bake sales and sponsors went to a special collaborative project between the Migrant Health Service and the Survivors of Torture and Trauma Assistance and Rehabilitation Service (STTARS). The two organisations are working together to organise a therapeutic social and cooking group for newly arrived refugee women. Groups such as this one have been shown to promote recovery and resilience in people who have suffered trauma and abuse. As a thank you for the Big Band's performance at GHC, and in recognition of the valuable work carried out by these services, the Australian Medical Student's Association kindly contributed to this project. The Orchestra's repertoire included pieces from Tchaikovsky's Sleeping Beauty, Beethoven's Egmont Overture and de Falla's Ritual Fire Dance. This year, Big Band (née Stage Band) featured Shofukan, Joy of Cookin', an arrangement of The Beatles' Blackbird and more. Vocal Ensemble brought Walking on Air and a feel-good ABBA Medley to the stage. This year we also added 3 new ensembles to our AUMO family! The Chamber orchestra made a comeback with Tchaikovsky's Serenade for Strings, the Jazz dance style came forward with White Stripes by Seven Nation Army, and the Percussion ensemble made an unforgettable debut with their own La La Land Medley! 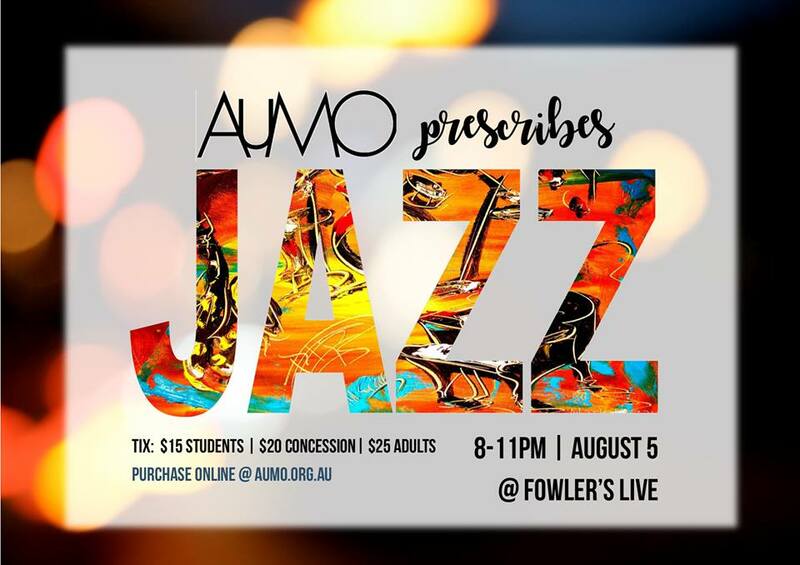 This year we decided to put on a brand new night at our new venue, Fowler's Live, just across the road from the new Adelaide Health and Medical Sciences Building. The evening offered fine wine, cheese and good music, featuring the AUMO Big Band and Gooseberry Jam straight from their successes at the AMSS Jazz Night earlier this year. All proceeds from this event went towards the National Centre of Aboriginal Language and Music Studies (NCALMS). NCALMS is a leading body of teaching and research into Australian Aboriginal music and languages, and is based at our own University of Adelaide. Its projects engage Indigenous students and communities to strengthen cultural connection and wellbeing. Our donation helped to purchase much-needed studio equipment for music teaching and media production work. We are very proud to announce that with our 2017 donations to STTARS and NCALMS, we doubled our total donation amount to charitable causes compared with last year!! We wish to congratulate all our members for their hard work and dedication towards making great music and supporting important causes.